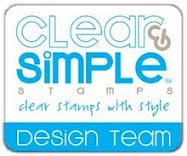 Just a quick post to share a card that uses one of the new heart dies from Clear and Simple Stamps and a sentiment from Clear and Simple Stamps Icons Extras set. I also added a couple of Prima flowers and a button. Thanks so much for stopping by. I hope you're having a terrific Tuesday. Happy Stamping!